Only moments from theaters and museums, this hotel in Milwaukee, Wisconsin offers guests a variety of convenient services and comfortable amenities for a memorable stay. Hampton Inn Milwaukee Northwest is just minutes from shopping and restaurants. Guests can explore the Harley-Davidson Tour Center or visit the Milwaukee County Zoo. 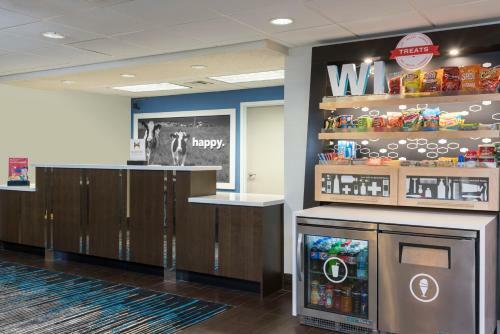 After a restful night of sleep, guests will enjoy a free breakfast at the Milwaukee Northwest Hampton Inn. Guests can swim in the indoor pool or relax in the whirlpool tub. The well-equipped business center features copy, print and fax services. the hotel Hampton Inn Milwaukee Northwest so we can give you detailed rates for the rooms in the desired period.